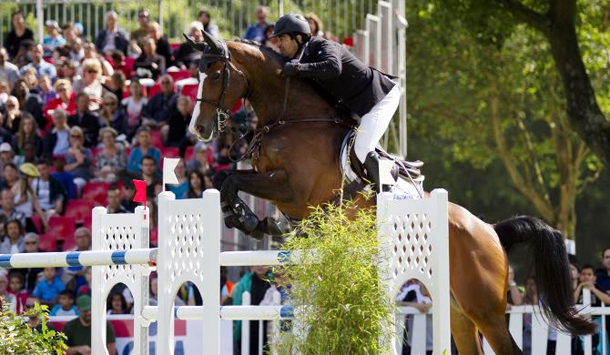 The CSI4* Franconville was concluded yesterday's afternoon with the victory of Karim El Zoghby and Amelia. After a very tough Grand Prix first round, only four riders have found their way to the jump-off. The Egyptian Karim El Zoghby achieved the fastest double clear, beating the American Brianne Goutal and the Belgian Olivier Philippaerts. A beautiful sunny day made it an enjoyable opportunity for the audience to attend the CSI4* Franconville. The course designed by Jean-François Morand did not leave indifferent riders. Marcel Rozier commented on the course, "we must not overlook the obstacles including number three the double of verticals after passing between the trees, the number five square oxer located after the river jump , the number seven yellow oxer; down, wave-shaped stockade to the exit and number ten, the triple; oxer, two strides, oxer then one stride a vertical, with a slightly shorter distance". His student, Moroccan Abdelkebir Ouaddar competed with Quickly to Kreisker, has also been surprised by the double entrance and also by the river jump. The clock has been the number one enemy for a lot of riders. Out of the forty-three competitors, eighteen failed to return home inside the eighty-six seconds allowed.